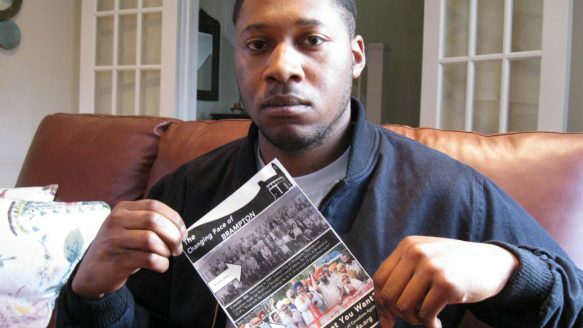 Brampton resident Jamal Jones holds an anti-immigration flyer that was delivered to his home this week. Jones says he finds the flyer offensive and racist. In Brampton, set to launch Sikh Heritage Month on Friday, residents a stone’s throw from city hall were shocked this week to find on their doorsteps anti-immigration flyers highlighting the Sikh community. “Racism is real; it’s still here. People have the fallacy that it’s ended and stopped. It’s very much not that,” said Wellington St. resident Jamal Jones, who discovered the flyer on his door earlier this week. Jones, 23, a second-generation Jamaican Canadian, found it offensive and racist. He decided to draw attention to this unacceptable act by posting a photo on Facebook, which later got picked up on Twitter and went viral. Idle No More – Renee Sons Sauci – 4/23/14. 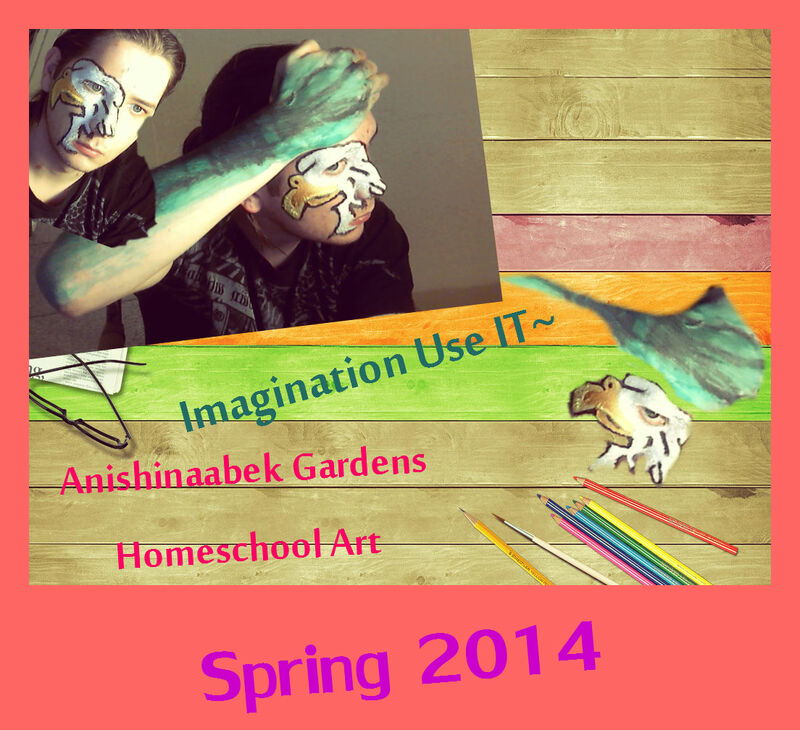 This is an excellent radio show detailing Native homeschooling. We are terrified of the disease that is White Supremacy. And let’s be even more honest: we are terrified of the bodies capable of spreading that disease. The effects of White Supremacy – otherwise known as racism – are very real. The mortality rates of people of color are much shorter than that of Whites; the educational and employment opportunities are much less for people of color; mass incarceration of Black and Brown people are at an all time high; and the likelihood to be Stopped and Frisked or detained for looking Brown and Undocumented are much higher for people of color….need I go on? I took a trip to my friendly neighborhood Walgreens tonight for a few necessities: antibacterial soap for my new tattoo, deodorant and a variety pack of tampons. I took my goods to the cashier and entered my phone number in the hopes of saving some pennies on my purchase. Naturally, my name popped up on the screen, and was seen by the guy behind the register. And then he mumbled some more stuff, which I promptly ignored as I swiped my card. I was unfazed. I am used to people being unwilling to accept that I am female. This was merely a blip in a long line of stories I’ve got that challenge what people think is “female.” And it wasn’t the only time it happened at a Walgreens. Many of us are working steadily with our family members so that they will be successful in their studies at home. But, often times you can feel like you are not doing enough to complete your goals. But don’t feel like you are behind, empower yourself and learn the secrets of homeschooling! The secrets of homeschooling starts with empowering ourselves to feel the best that we can feel. It is imperative that we allow ourselves rest, relaxation, and time for outdoors. When taking the children out on field trips you can enjoy everything that you experience while outside of the home. Also remember that a little art can go a long way. Being creative with face paints can liven up the kids, especially when they get to paint parents or older siblings. But if you can get outdoors in the beautiful nature, that is always best. I make it a purpose in our homeschool to get out and see the world. Most of our travels are done in the summer time but we also visit indoor facilities in the winter and we do get out in the snow! You may want to make it one of your goals if you are just starting to homeschool, to get outside of the home and take the kids exploring. You do not have to go on expensive trips and waste tons of money. You can get out to small local field trips in your area. Go to library functions that some local libraries have and take out time to frequent local parks. We break into the spring by camping and cooking out in a nearby campground. We pack our bags and head out to have fun in the woods. A good spring campfire, jokes and stories can lighten the load of any homeschooling family. We go to a nice little cozy campground in the spring that has an indoor swimming pool as well as a lake for fishing and games for the children to play. Weekends are best for spring camping and if you are in the north make sure you pack lots of sleeping bags and blankets for the cold spring nights. So, stop worrying about how you will relieve the stress and just get out there and do it this spring! Empower yourself with happiness and relaxation from our Mother Earth! Students learn in many different ways, whether they’re a visual learner preferring pictures and shapes, or an auditory learner preferring sounds and rhythms. Oftentimes, we use a mix of learning styles and techniques to process information. Unfortunately, traditional textbooks simply can’t meet students’ diverse learning styles, since every student has unique interests, attention spans, and needs. So how do we ensure the success of every student? The key to a personalized learning experience is technology. 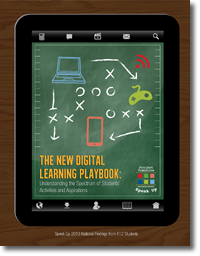 A recent study from Speak Up published this month explored how K-12 students are using digital tools and resources to enhance their schoolwork activities.